The basic booth design uses modular panels provided by the organizer for the back and side walls (see the figures). You can select any floor pattern from those below according to the number of modular panels you wish to use. If you need more than 19 booths, please contact the organizer's office. The height should be a maximum of 2.7 meters. However, in the setback area, which is one meter from the aisles and basic panels, the height should be a maximum of 3.6 meters. The height should be a maximum of 5 meters. Companies wishing to rent a booth at the Renewable Energy 2018 Exhibition should fill out the necessary items in the Booth Application Form and mail it to the Show Office. Applications for booths may be rejected if they are judged not to comply with the purpose of the exhibition. An invoice is issued after the application for renting a booth is accepted. Please transfer the amount on the invoice to the nominated bank account by the date indicated. The bank fee for the transfer is paid by the exhibitor. Also please note that if there is no payment by the date given, the application for the booth may be cancelled and that a cancellation charge will apply. In principle, cancellations are not accepted. However, the organizer may accept a request for cancellation if there are deemed to be legitimate reasons, subject to the following cancellation fee. If the exhibitor has yet to pay the amount shown above, it should be paid promptly. If the amount the exhibitor has already paid exceeds the amount shown above, the organizer will refund the balance. The organizer will determine the booth layout after considering the order of application, number of booth and exhibit items. These will be announced at the explanatory session for exhibitors. If two or more applicants are making a joint display, one company should lodge the application as a representative and notify the organizer of the coexhibitor's company name etc. Communication from the organizer's office will be sent only to one representative company. The exhibitors and booth applicants must obtain the approval of the sponsor in advance when lending, selling, conveying or exchanging a part or all of the exhibit area. 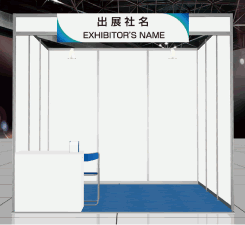 The exhibitor or its agent must wear an exhibitor badge designated by the organizer during the exhibit period and must always be present in the booth. These individuals shall serve visitors and manage the booth items. When an exhibitor or its agent damages another booth, exhibition facilities, site facilities or injures an individual or such, said exhibitor will be responsible for compensation. It is recommended that the exhibitor take out liability insurance for necessary items for the period from when items used in the exhibit are transported to the venue until they are removed. When it is decided that holding the trade fair would be difficult due to a natural disaster, man-made calamity or for other reasons, the organizer shall delay or cancel the trade fair. In the event of cancellation, the booth charge will be returned to the exhibitor minus necessary costs. The organizer shall take responsibility for bearing other costs, damages and suchlike. The period for delivering exhibit items and suchlike to the venue, the fitout period at the site and other details will be explained at the exhibitors' information session. During the period of the trade fair, exhibitors are prohibited from delivering, removing or moving exhibit items without the permission of the organizer. The exhibitor shall be responsible for maintaining and cleaning the exhibited items and items in the booth. The organizer shall remove exhibited items and articles not removed by the designated removal date at the expense and risk of the exhibitor. The use of microphones inside booth to explain products, the volume of AV equipment and the volume of sound emitted by the products themselves shall be kept within the level of common sense as far as possible considering relationships with nearby booths. The organizer shall establish and revise the various regulations to ensure the smooth running of the exhibition. In addition, items not included in the exhibit procedures may be determined individually and the procedures added to or changed. If an exhibitor violates the exhibit procedures, the exhibit rules or other material in the exhibitor manual, the exhibitor may be denied permission to set up their booth. In this case, the booth rental will not be refunded. The organizer shall control the site by contracting with a security firm for the entire period from delivery and other preparations to removal. However, the organizer bears absolutely no responsibility for damage, losses, theft or suchlike of exhibit items. All exhibitors and their agents shall be deemed as having approved the exhibit procedures and other rules established by the organizer when they submit a booth application. Entities wishing to hire a booth are requested to read through this procedure and submit a Booth Application Form. An invoice for the booth will be sent when a Booth Application is received. At this session, the exhibitors will receive Exhibitor Manuals and forms for guidebooks concerning preparations and operation of the trade fair, electricity and various other application forms. An explanation will also be provided concerning the delivery, fitout work, operation and removal of items. If a natural catastrophe or other circumstances beyond the control of the organizers necessitate cancelling, rescheduling or postponing the exhibition, the organizers will not accept liability for any damages, expenses or losses incurred by the exhibitors.